The ulnar nerve is one of the 3 major nerves extending from the spine to the far reaches of the arm, into the hands and fingers. It gets its name from the bone it travels by in the forearm called the ulna bone. Other major nerves in the region are the median and radial nerves. The ulnar nerve is composed of a collection of multiple spinal nerve roots. The ulnar nerve provides sensory to sections of the hand and motor control of many muscles used to move the hand and fingers. The ulnar nerve can become entrapped for a variety of reasons, yet a common finding between all of the reasons is the fact that the nerve swells. Swelling of the nerve creates a sticking point within a bony tunnel or soft tissue tunnel. This is known of the area of entrapment. Although the location of ulnar entrapment can vary, the symptoms will reside in the hand or wrist. How to find the exact region of entrapment will come later in this article. Proper and timely diagnosis of ulnar nerve entrapment is key in recovery. Experiencing the above mentioned symptoms for more than two weeks requires medical examination to ensure return to normal. If you’re experiencing symptoms for more than two weeks you could experience long-term nerve damage and loss of full ability to use your hand. In most cases, a proper diagnosis can be attained with a detailed examination of the neck, shoulder, elbow, wrist, and hand. Your doctor should perform test such as: reflexes, arm strength, hand strength, skin sensation, amongst other local stress testing of the local joints to troubleshoot ways to reduce the entrapment. Standard care targets a reduction of nerve swelling through immobilization and decreasing inflammation. More advanced forms of treatment have been developed in recent years, with can produce rapid results. Advanced forms of treatment also target a reduction of nerve swelling via physically removing the pressure from the nerve. Advanced care uses the muscles of the body to provide a consistent decompression of the nerve by enhancing stiffness of certain muscles and reducing tightness of other muscles. This method of treatment is best for most cases who are beyond 3 days of symptoms. These methods of treatment should always be implemented in the beginning by a medical provider educated in corrective exercise before performing at home. For severe cases, surgical decompression may be required to preserve the ability to use the hand in the future. These are used in cases where hand wasting has occurred. 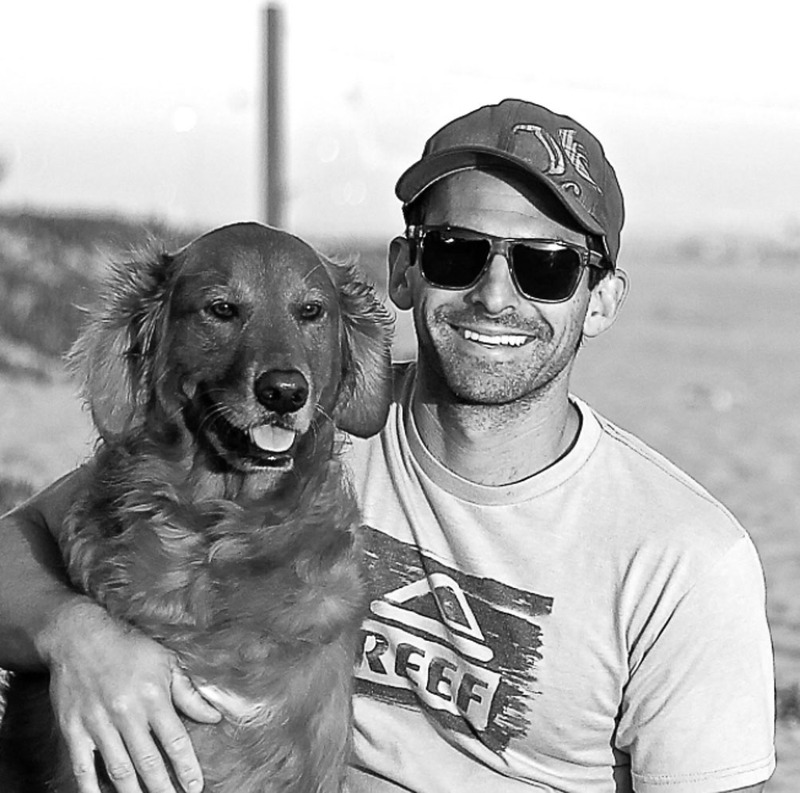 For step #1 in recovery, keep reading. Finding the location of ulnar entrapment comes before knowing how to treat it. I’m Dr. Sebastian Gonzales. I wanted to share this image that I drew (scroll down) about the 5 most common impingement sites of the ulnar nerve (and for nerve that contribute to become the ulnar nerve) so you can get a complete understanding of why I created an affiliated ebook as an addendum to the massive ulnar nerve article. There are many different possible reasons why the ulnar nerve (nerve contributing sensation feedback to the ring and pinky finger), is going heywire. Numbness when sleeping often times leads to daytime numbness, which can leave to hand muscle atrophy if left untreated for years. Sadly I’ve seen this before. I had a friend I played ball with that lost so much muscle in his hand over the course of only one year that I wouldn’t doubt he won’t be able to swing a bat anymore because of decreased hand strength. I can’t handle that happening to anyone again since it’s very treatable and honestly is just silly to not start treating this very reversible condition. On these infographics, I’ve included the 5 most common entrapment sites for the ulnar nerve and its contributing nerves. The magic when you find the correct rehab for you really starts by identifying the correct site before you implement a treatment strategy for the problem of hand numbness. When correctly diagnosed, treatment is very simple and can reduce numbness tingling and loss of sensation dramatically even over the course a few weeks. 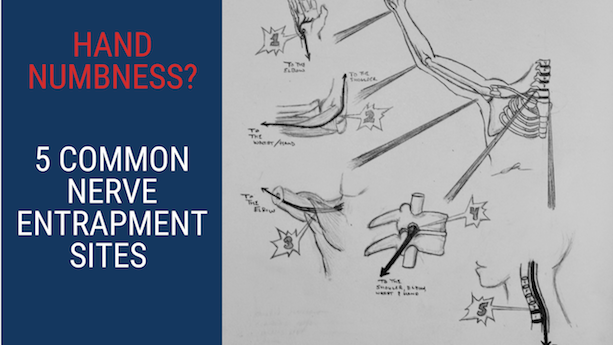 Proper diagnosis can oftentimes be the hardest portion of implementing care for even a seasoned clinician, especially if they haven’t had experience with an upper extremity nerve compression like this. I personally have had great success reducing people’s symptoms by taking a through history and exam; by through I mean it sometimes takes hours. If you’re doc only spent 5 minutes with you and didn’t physically touch you to exam your condition then his/ her exam was not enough in my experience. I have requested neurodiagnostics testing but only in very tough cases, certainly not the majority because they are often times not needed. You cannot solve a problem unless you know the problem IS. This led me to create the simple graphic looks and correlates with the book/ eCourse that I created. Let’s take a look at infographic. 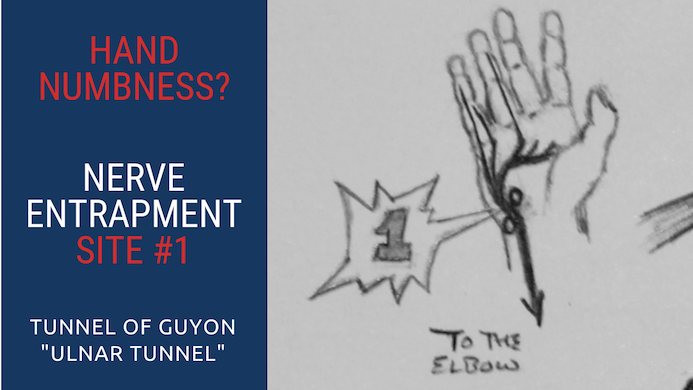 Number #1 on infographic is an extremely common ulnar nerve entrapment site for cyclists. As the ulnar nerve passes through wrist it can become pressured at the Tunnel of Guyon. This is exactly where a cyclist often times places their wrists onto the handlebars, yielding the slang diagnosis of Handlebar Palsy. As you can see in the drawing, there are two circles that form the bony sides of the tunnel that the ulnar nerve passes through. These bones of the wrist, in addition to some fascia in the region make up the Tunnel of Guyon. Excessive compress between the wrist and handlebars, especially with poor padding, reduces nerve flow into the pinky and ring fingers. 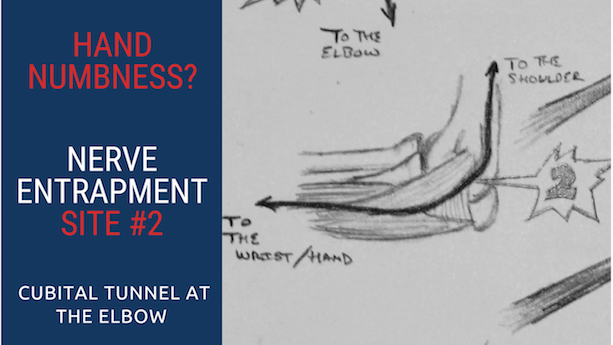 If the problem is too much compression, an obvious solution is to reduce the amount of compression of the ulnar nerve between the tunnel and the handlebars. This is possible by adding more padded grip to the handlebars, wearing gloves, or changing the hand position when riding. This location of ulnar nerve entrapment can also present in people who work frequently with their hands daily. Day Laborers, factory workers, and other people in the service industry can be affected by this location of entrapment. NOTE: It’s important to consider that nerve entrapments don’t often occur in isolation. Nerves slide and when there’s a reduction of normal sliding mechanics, recovery may take longer. Look at the drawing… see how long the nerve is? 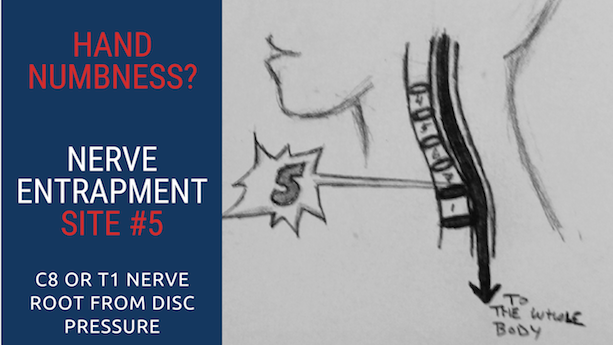 When a nerve is being sensitized in one location (compression site) often times improving slide mechanics of the rest of the nerve can reduce local sensitivity. In the case of an ulnar nerve being affected at the wrist, if we improve the ability of the ulnar nerve to slide throughout the rest of the arm then we can accelerate the healing process. Sounds complicated, but it’s really not. It’s just physics. Forget the location where the entrapment is just move the shoulder, elbows and body around in circles. This is a very general way to increase slide contribution to the area that is “stuck.” Think Tai Chi! (DISCLAIMER: With the help of your healthcare provider’s diagnosis). It’s literally everything I know about the ulnar nerve and how to decompress it. Another common compression location of the ulnar nerve is within the elbow region. It’s called the Cubital Tunnel. Compression of the ulnar nerve in this location is called Cubital Tunnel Syndrome. The Cubital Tunnel is composed of bony borders and a soft tissue roof. The ulnar nerve travels amongst these tissue to make its way out into the wrist, but it can become compressed along the way Remember even small amount of pressure from boarders of the tunnel can create changes of sensation into the wrist and fingers. An amazing, but rather unknown, treatment I use is something called Dermal Traction Method. This style of treatment is “decompressive” in nature. This is where we grabbed the skin above or below the cubital tunnel in an effort to “lift the skin off of the nerve” so it can decompress. Surprisingly, a simple decompression of the skin from the ulnar nerve reduces numbness in almost half the people with a confirmed ulnar nerve compression at the Cubital Tunnel. Credit to Dr. Justin Dean DC and Dr. Phillips Snell DC for creating this method of care that works so well. Even if dermal traction therapy works in decompressing the ulnar nerve at the elbow, I’d consider the strong possibility that we need to restore optimal nerve slide mechanics to reduce chances of relapse. You may be wonder why this becoming so complicated? That’s a valid question but the answer isn’t simple, it’s complicated sometimes. When one is able to completely understand how to reduce pressure on the ulnar nerve throughout its entire pathway, as well as increase slide through bony/soft tissue tissue tunnels, then the effectiveness of treatment increases and the time to resolve the condition decreases. That’s what we all want right?! Quick fixes are quick fixes for reason. They’re often times incomplete, short-term solutions. Although I’m mentioning some of the treatments I often use, you should read the entire eCourse to get as much information as you can. Quick fixes are a great start but no place to stay. Another common location for the ulnar nerve to become entrapped is at the shoulder. In this region, the ulnar nerve actually becomes the ulnar nerve. As we move higher, we are really considering the contributing nerves that form the ulnar nerve as being the nerves that are compressed. The ulnar nerve is considered is a mixed nerve, as it doesn’t originate from one single level of the spine. In the shoulder region, I oftentimes find people’s symptoms increased when anti-shrugging (but not always, sometimes this is relieving), when their arm is cocked backward (throwing a baseball) or raising their arm (answering a question in school). Occult dynamic movement-based instability of the shoulder can place light pressure on the nerves as they pass into the arm. This light pressure can trigger a change of sensation in the last two fingers on the hand. Occult dynamic movement-based instability can happen a few ways biomechanically. The most common is when the humeral head moves forward (anteriorly) and creates pressure of the soft tissue aspects of the tunnel where the nerve bundle travels downward to the arm. My long-term play in these types of cases, is to stabilize the shoulder region so the soft tissue tunnels in the region no longer places pressure on the nerves. However many times, we need to apply first aid to the nerves in the beginning of care. This is a great example of how passive and active care for the ulnar nerve can be applied for different cases, at different points in their care. 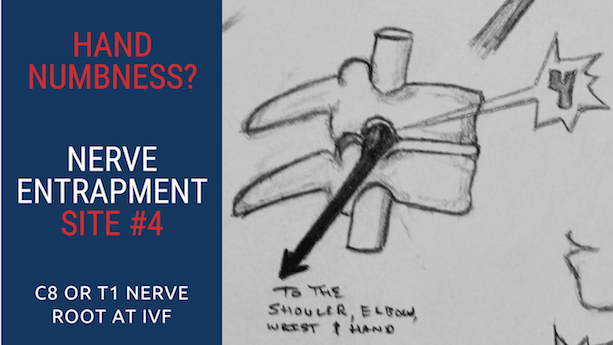 Typically nerve first aid is passive, yet once the nerve desensitizes we are onto active care to correct the shoulder instability issue. Nerve first aid can take a week or two oftentimes. The suggestions are kind of funny though because they’re the exact opposite than you would think for the shoulder region to heal… but remember we are paying attention to the nerve, not the shoulder yet. That will come! Remember this is rehab that is prioritizing the nerve first. What’s good for the nerve is not always good for the shoulder. Rehab of the nerve comes first and then rehab of the shoulder, musculoskeletal system comes second. 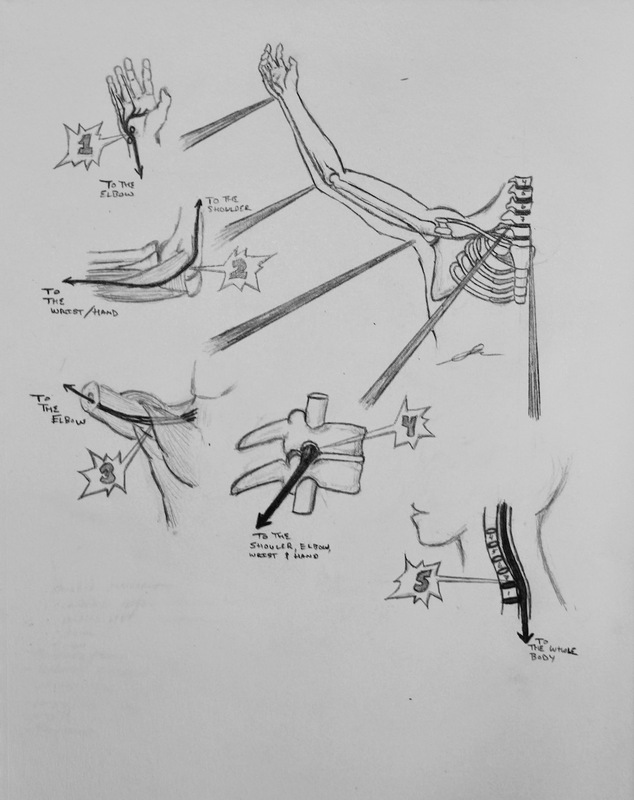 I’ve laid out some more fundamentals in the ulnar nerve eCourse. Another location where contributions to the ulnar to become compressed is within the spine, or just as the nerve roots exits the spine. Common levels of irritation are at spinal nerve roots C8 and T1. Let’s break this down into two different ways it can become pressure in the area. A nerve root can very frequently become entrapment was it exits the spine. The interface that can create pressure is a boney interface called the intervertebral foramen. Intervertebral foramen in layman’s terms means “hole.” This hole is narrowed as you look up towards the sky or tilt your head towards the side of the numb fingers. Head movement in the other directions generally dissipates symptoms into the hand. Lightly stretching the head downward and away from the numb side typically will decrease symptoms into the hands, but that’s a very short-term solution. 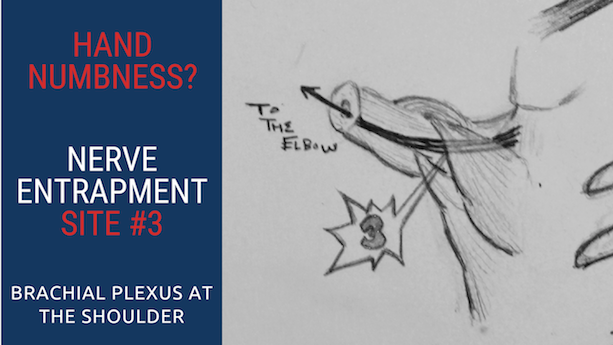 Just like in the shoulder, nerve first aid should be applied first and musculoskeletal health comes second. In this case, the “opening of the hole” is the first add and then we would tangent care to addressing WHY the hole was closing poorly in the first place… normally it is because if the midback or shoulder complex not working well. In this case, stretching the neck too far may traumatize other soft tissue in bony areas within the neck which can’t cause collateral issues. (on both or one hand at a time). A cervical disc herniation can project posteriorly (backwards) creating pressure on the spinal cord itself or the exiting nerve roots. Often times bending the neck forward, or tucking the chin towards the chest, increases symptoms to the hand or hands. Looking towards the sky oftentimes decreases symptoms but is not 100% comfortable either. This is the polar opposite from the nerve entrapment at the intervertebral foramen. Although a disc herniation may present in this fashion other types spinal-based conditions can also present this way such as: space occupying lesions and tumors. This is a reason why you should always be examined by an educated healthcare professional who can guide you to correct diagnosis and treatment. If you want to learn more about treatments for the ulnar nerve check out the eCourse I created. Hand numbness is not a urgent issue for most people who experience it a few night a week, but it should be something to investigate. Some of the most painful conditions you can imagine, actually are less urgent than nerve compression that alters sensations. I tell new patients in my office all the time, “If you decide to not come back and see me that’s fine, but I want you to know that you MUST get rid of this numbness within the next few weeks. This is considered a neurological condition and is actually pretty serious if it progresses beyond the stage of only numbness. I hope the graphic was helpful and if you’d like to see me in Southern CA, I’m located in Huntington Beach. Use the “Book Now” button on the homepage of the site.